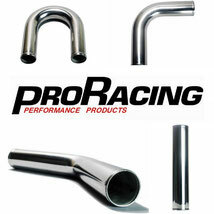 PRO Racing Intercooler Pipe is quality mandrel bent piping with beaded flared ends to stop the silicone joiners coming off under boost pressure. * Quality clamps available to suit our alloy intercooler pipe. We also stock a range on silicone joiners including straight, 45°, 90°, 135°, 180° and T Pieces. CLICK HERE to go to the silicone page.